The story begins more than 100 years ago, in 1892 to be precise, when master baker Engelbert Hauser from Bollschweil in the Grand Duchy of Baden opened his first bakery and confectionery on Dufourstrasse in Zurich. Some years later he opened a second shop on Fraumünsterstrasse in Zurich. His son, Albert Richard, took over the main business in 1924. Eight years later Albert Richard Hauser continued the success story by opening yet another shop on Bahnhofstrasse in Zurich. His son Albert then took over from 1949 to 1954. 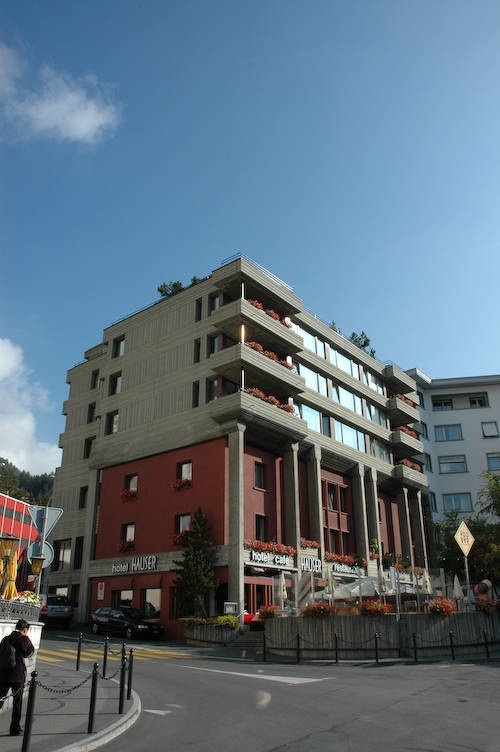 However, when the lease was due to run out in 1955 and was not due to be renewed after 23 years, Albert Hauser kept an eye out for something new, which is when St. Moritz caught his attention. 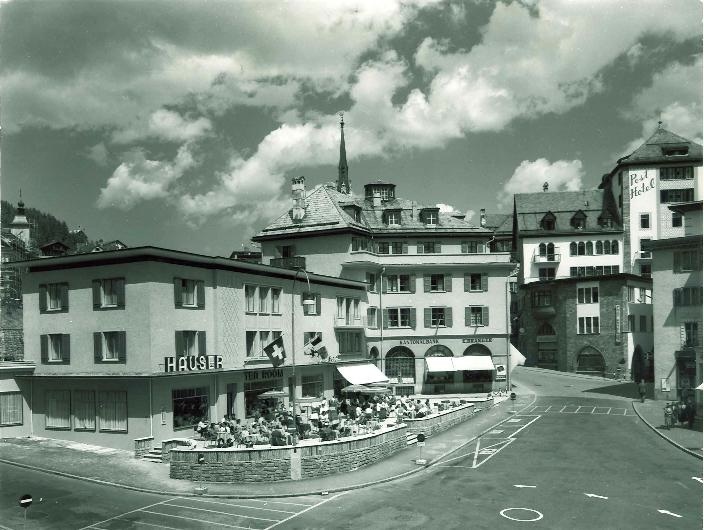 The Graubündner Kantonalbank property at the old Postplatz in St. Moritz was perfect; following renovations, the shop reopened in December 1955. The new Café-Restaurant Hauser was born. It contained a tea room with room for 220 guests, a confectionery, a floor with 18 hotel rooms, as well as a floor for owners and employees, not to forget the legendary sun terrace, which at the time could seat as many as 80 guests. After 15 successful years in the business, Albert Hauser Jr. decided to take another decisive step; the building that exists today was built over a period of eight months in 1970. Architect Robert Obrist had the brilliant idea of adding the new construction over the old building on self-supporting pillars. The traditional tearoom was converted into a modern restaurant in 1973. It successfully survived its baptism of fire during the World Ski Championships in 1973/74. Robert Obrist was once again brought as the architect for this conversion, together with interior designer Gian Franco Legler from Zurich. Today the hotel has 82 beds in 51 modern rooms, all featuring three-star comfort. Management progressed into the fourth generation of Hausers when Markus and Marinda took over in 1985. Further milestones in the Hauser success story include the renovation of the reception area and the remodelling of the confectionery in 1991 by architect H. J. Ruch. Both large and small renovations are carried out in the hotel in every off-peak season: the kitchen has been renovated, the heating has been modernised, a heating recovery system has been installed and all windows have been replaced. In addition, around 1.3 million francs have been invested in redesigning and renovating all bathrooms in the hotel. Thanks to regular investments, the entire building is in excellent condition. Management’s top priority is to ensure the satisfaction of all guests from near and far throughout the entire year. Tradition and innovation are the cornerstones of the Hauser success story and are reflected in the hotel’s positioning for guests of all ages.